Love it, now you just have to make 100 more and you'll be set for Christmas! Wow, Colleen! You definitely captured that table runner beautifully! You have a true knack for figuring out how to translate everyday items into lovely card designs. I just love that! And I love seeing the originals that inspired you. And look at you go on those challenges. Great colors and awesome use of your official Punchkateer punchez. RYPH!!! Thanks for joining us in this week's Stamp Simply "Christmas in July" challenge! Oh this is wonderful! So elegant, and I really love the way you made the tree from the leaves of the bird punch. They look fabulous! I love that punch too - it's so versatile. Way to use those punches! So clever and so pretty! Thanks so much for playing in the Tea Room this week! What a super cool use for that punch! 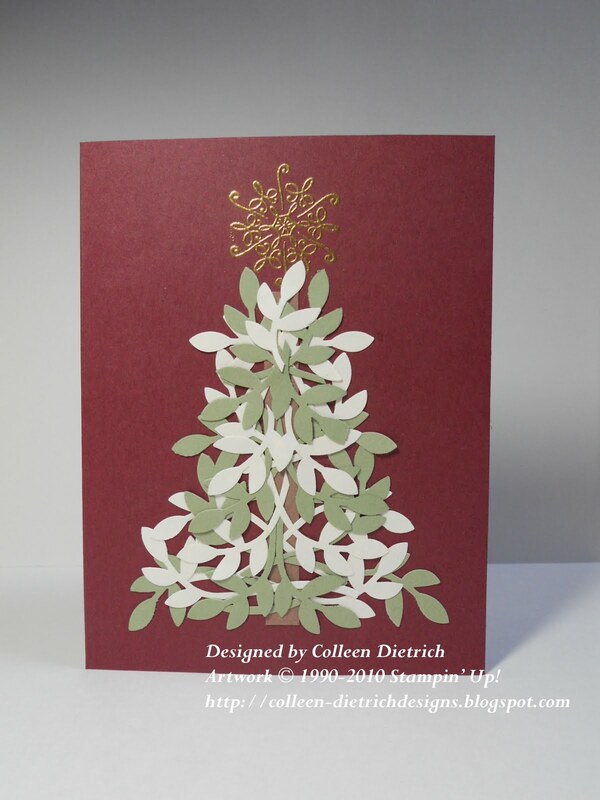 Love the tree you created and love the embossed star. Thanks for joining us this week in the Tea Room. What a creative use for that wonderful punch! Thanks for the great instructions and inspiration. Great card, great use of a punch. Thanks for joining us at CCT this week.